This dialog box allows the modification of the contents of Core. It is reached by double-clicking on an instruction in a Core View window. That instruction appears in the edit box, and may be changed in any way (as long as the result is a valid Redcode instruction). Moreover, multiple instructions may be entered, using any of the source code conventions (including labels, equates, for/rof loops, expressions, etc). When the OK button is clicked, the source code is compiled, and the resulting instructions replace the original instruction and the ones following it. If the source code produces compile errors, the dialog box does not close. 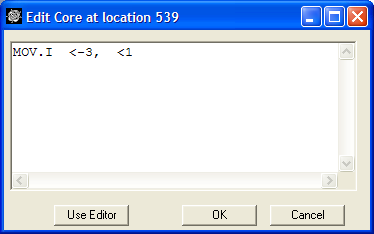 The Use Editor button brings up the Edit Warrior dialog box, in which source code may be loaded from files, edited, and compiled to reveal any compile errors.